MUBE, MUSEU BRASILEIRO DA ESCULTURA, IS PLEASED TO PRESENT “INTERPLANETARY CONSTELLATIONS 2012”, KATJA LOHER’S FIRST SOLO SHOW ON THE CONTINENT OF SOUTH AMERICA. 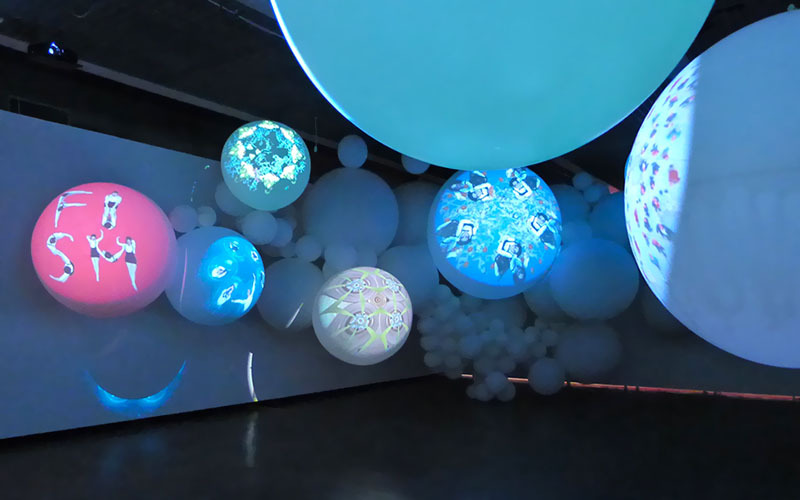 New York-based Swiss video artist Katja Loher (b. 1979) belongs to a new generation of innovators and has taken video sculpture to a new level. Her works create a dialogue between themes of nature and technology by integrating traditional forms of sculpture with futuristic performance art and video. Loher’s sculptures are a logical outcome of her extensive exploration of video, choreographed dance, performance, sound and sculpture, both static and kinetic. Her playful installations and objects and her diverse worlds are so alive that they have the power to draw the viewer in. The objects inhabit the museum spaces in “interplanetary” constellations. In video recordings from a bird’s-eye view, choreography literally transforms dancers’ bodies into letters and words that form a kind of language the artist calls Video Alphabet. In the post-production process, Loher embeds the recordings into scenography whose arc of suspense provides a contrast to the unfolding sentence or phrase and its possible interpretation. 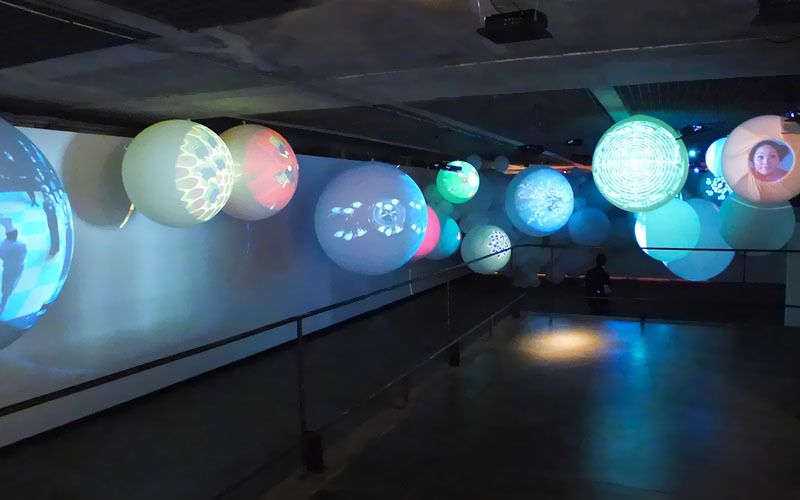 For the exhibition at MuBE Katja Loher has created an ‘interplanetary’ installation. 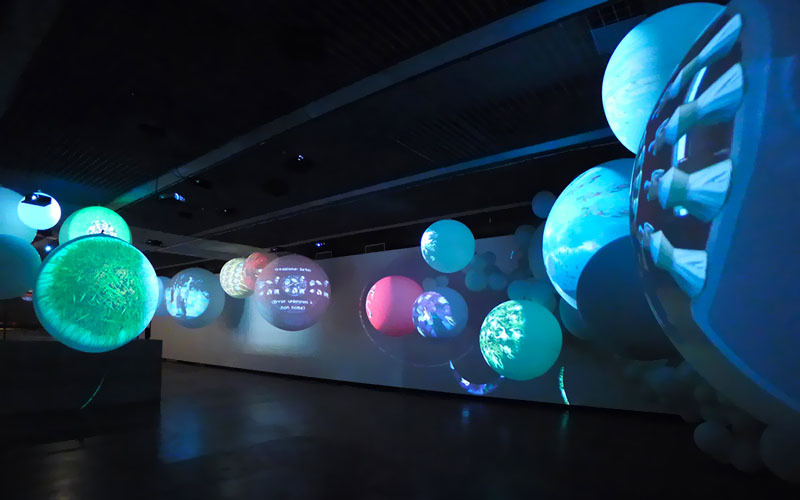 Viewers are inside a constellation of video planets in which videos are projected onto balls made out of shiny balloons. The aptness and humor of the videos adds a levity and delicacy to the installation. The objects fill up the space of the museum, float, or simply remain in place as though they were in a real universe. At the end of this journey through the ‘universe’ the public comes across the Schachfeld/The Chess Board (2007), where they can watch a chess match played by a robot. Suddenly they realize things aren’t under control, the chess figures are as though they are alive. Chess reveals the relationship between those who rule and those who are ruled; they defend their class interests with the black and white figures and unite in their revolt against the king. But given the lack of experience in ruling and responsibility they cannot succeed at overthrowing the ruler. The chess board becomes a battlefield on which social contracts collapse, the pawns lose control, chaos ensues, and everyone involved is forced to look after themselves – if they still can. ‘Katja Loher thrilled participants at the Prague contemporary art festival TINA B., where her work reaped ovations. I’m very pleased that this opportunity will now be brought to visitors to the Brazilian museum MuBE, where Katja Loher is showing work for the first time ever’, added the exhibition’s curator and director of Vernon Gallery, Monika Burian Jourdan. One thing is certain: Katja Loher is always surprising audiences with her imagination, aptness and humor. Her works stimulate our dreams, experimentation, fantasy, and laughter, evoke magic, and reveal perspectives that are too often missing from everyday life. Her playful installations and objects and her diverse worlds are so alive that they have the power to pull the viewer deep inside.